Analysis: Burnett was granted his release from the Steelers on Monday after a disappointing 2018 in which he totaled only 30 tackles in 11 games. The 30-year-old should compete for the starting role at strong safety with new addition Eric Murray, as 2018 starter Jabrill Peppers was sent to the Giants in the trade for Odell Beckham (quadriceps) in March. The Steelers have released Burnett. Analysis: Burnett fell off the IDP radar last season, logging just 30 total tackles in 11 games in his first and only season with the Steelers. Whether the 30-year-old resurfaces on the fantasy radar in 2019 depends on where he ends up, but it seems unlikely he'll approach the statistical heights he reached during his peak years as a Packer. The Steelers informed Burnett he will be released before Apr. 1, Adam Schefter of ESPN reports. Analysis: Pittsburgh planned to release the 30-year-old safety this past Wednesday but will wait another week because of an accounting issue. Regardless of when it happens, Burnett figures to have trouble finding a starting job on the open market, as he hasn't played a 16-game season since 2012 and struggled in coverage the past couple years. It wasn't so long ago that Burnett was the top tackle compiler among all defensive backs, averaging 7.6 per game in 60 appearances from 2011 to 2014. Burnett reportedly would like to be released by the Steelers to pursue a more traditional safety role elsewhere, Ian Rapoport of NFL Network reports. Analysis: Burnett had 30 tackles in 11 games during his first season with the Steelers, and was overtaken for snaps at strong safety by rookie Terrell Edmunds. The veteran then served in a hybrid safety/linebacker role, but apparently wants to play the more traditional position. Burnett carries about a $6.5 million cap hit for next season, and could be released with approximately $2.8 million in dead cap. Burnett had three tackles (all solo) during Sunday's 16-13 win over Cincinnati. 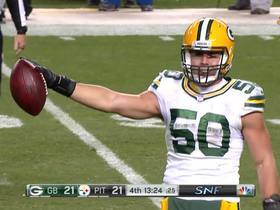 Analysis: After eight years with Green Bay in which he averaged more than 87 tackles per season, Burnett struggled in his first season with Pittsburgh, finishing the 2018 season with 30 tackles in 11 games. Outplayed by rookie Terrell Edmunds, Burnett still has two years remaining on his current contract and will likely return in 2019 to provide depth in the Pittsburgh secondary. Burnett (back) is active for Sunday's game against the Raiders, Jeremy Fowler of ESPN.com reports. Analysis: Burnett was listed as questionable despite three full practices this week, and will make his return after sitting out Week 13 against the Chargers. The 29-year-old should assume his rotational role at strong safety behind rookie Terrell Edmunds. Burnett (back) is questionable for Sunday's game against the Raiders, Teresa Varley of the Steelers' official site reports. Analysis: Burnett sat out the Steelers' Week 13 loss to the Chargers due to a back injury, but he has now logged three straight full practices. If the veteran safety is able to suit up against the Raiders on Sunday, he'll play his usual rotational role. Burnett (back) was a full participant at Wednesday's practice. Analysis: Burnett sat out Sunday's loss to the Chargers after not practicing during the week. His advancement to full participation after the week off well puts him on track to return Week 14 against the Raiders, with a reserve role at safety likely awaiting him. Burnett (back) is officially inactive for Sunday's game against the Chargers. Analysis: Burnett was listed as doubtful after not practicing this week, so his inactive status Sunday was to be expected. The veteran safety has played limited snaps in recent weeks, and rookie Terrell Edmunds will continue to start at strong safety. Burnett (back) is officially listed as doubtful for Sunday's game against the Chargers, Teresa Varley of the Steelers' official site reports. Analysis: Burnett did not practice in any extent this week, and he appears on track to sit out Sunday's primetime tilt against the Chargers. If Burnett is indeed unable to suit up Week 13, expect Jordan Dangerfield, Mike Hilton and Artie Burns to benefit from slightly increased workloads. Burnett (back) did not practice Wednesday. Analysis: Burnett is nursing a back injury of undisclosed severity, which he appears to have picked up during Sunday's 24-17 loss to the Broncos. The veteran safety saw his lowest snap count of the season (18) during the Week 12 lost, possibly due to the nagging back issue. If he's unable to suit up against the Chargers on Sunday, expect Jordan Dangerfield, Mike Hilton and Artie Burns to see slightly increased defensive roles. Burnett had five tackles (three solo) during Thursday's 52-21 win over Carolina. Analysis: A nagging groin injury that forced him to miss several games earlier this season seems to be fully recovered, and he now has 10 tackles in his past two games. Heading into a Week 11 game against Jacksonville, Burnett has no passes defended and no interceptions, seriously limiting his fantasy value. Burnett (groin) was a full participant in Wednesday's practice, Teresa Varley of the Steelers' official site reports. Analysis: Burnett has remained sidelined due to a lingering groin injury since Week 2, but appears to be nearing a full recovery. "It felt good to be able to participate and get back in the normal flow of things," Burnett said. If the veteran safety can continue to fully participate in practice, he appears on track to suit up against the Browns on Sunday. Burnett (groin) logged a partial practice Monday and could play Sunday against the Browns, Dale Lolley of DKPittsburghSports.com reports. Analysis: The 2010 third-round pick has been dealing with a groin injury and has not seen the field since Week 2 against the Chiefs. The fact that Burnett is at least practicing in limited fashion is a positive sign for his Week 8 availability. It's unclear whether Burnett would assume the starting job if he's able to play in Week 8. If he doesn't suit up, however, Terrell Edmunds would likely continue to start at safety. Burnett (groin) has been ruled out for Sunday's matchup against the Bengals. Analysis: Burnett didn't log a practice this week and hasn't played since Week 2 against the Chiefs. In his absence, fellow safety Terrell Edmunds has gotten at least 70 defensive snaps per game. That volume is likely to continue with Burnett sidelined again. Burnett (groin) is considered doubtful for Sunday's game against the Falcons, Teresa Varley of Steelers.com reports. Analysis: Burnett was unable to participate in practice Thursday and Friday after limited participation Wednesday, so his outlook for Sunday in terms of potential availability worsened throughout the week. 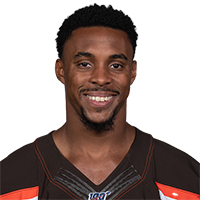 If Burnett is unable to suit up Week 5, Terrell Edmunds would be in line to draw his fourth start of the season at strong safety. Coach Mike Tomlin said Burnett (groin) is expected to practice this week, Dale Lolley of DKPittsburghSports.com reports. Analysis: Burnett has missed the last two games after suffering a groin injury in mid-September. He spent the first eight years of his career with Green Bay before joining the Steelers this offseason. Burnett (groin) is listed as inactive for Sunday night's tilt against the Ravens. Analysis: Burnett aggravated the injury during practice this week and will miss a second straight contest as a result. Nat Berhe will take his place. Burnett (groin) is doubtful to play in Sunday's game against the Ravens, Teresa Varley of the Steelers' official site reports. Analysis: Burnett injured his groin in Thursday's practice and was unable to return Friday. In his likely absence Sunday, Nat Berhe is slated to take on extra snaps. Burnett (groin) was a limited participant in Thursday's practice, Joe Rutter of the Trib Live reports. Analysis: Burnett was able to fully participate in practice to begin the week, so Thursday's participation is a downgrade. It remains to be seen whether the veteran safety suffered a setback, or whether the Steelers are simply taking a cautious approach to Burnett's recovery. Burnett should be considered questionable to suit up for Sunday's game against the Ravens. Burnett (groin) was a full participant at Wednesday's practice, Ray Fittipaldo of the Pittsburgh Post-Gazette reports. Analysis: Burnett was inactive for Monday's win over the Buccaneers after being listed as doubtful. Coach Mike Tomlin expressed optimism Tuesday about the veteran safety's chances to play Week 4, and Wednesday's full participation furthers that notion. Head coach Mike Tomlin said Tuesday that Burnett (groin) has a chance to play in Sunday's game against the Ravens, Ray Fittipaldo of the Pittsburgh Post-Gazette reports. Analysis: Burnett was held out of Monday's game against the Buccaneers after being limited in practice all week. His status for this week remains unclear, and whether the veteran safety is able to return Sunday night likely depends on how much he is able to practice. Burnett (groin) is inactive for Monday's game against the Buccaneers, Teresa Varley of the Steelers' official site reports. Analysis: Burnett was limited in practice all week and was doubtful heading into Monday. The veteran's absence will hurt Pittsburgh's depth at the safety position, but rookie Terrell Edmunds looks poised to take on a starting role against the Buccaneers. The Steelers have listed Burnett (groin) as doubtful for Monday night's matchup with the Buccaneers, Ray Fittipaldo of the Pittsburgh Post-Gazette reports. Analysis: Burnett was limited at practice throughout the week, so it surprising that he did not draw a questionable designation. If he is unable to suit up -- which currently seems likely -- Jordan Dangerfield, Nat Berhe and Marcus Allen could all see a slight bump in action. Burnett was a limited participant at Thursday's practice with a groin injury. Analysis: Burnett outsnapped rookie Terrell Edmunds by a 52-32 margin in Sunday's loss the the Chiefs, despite being listed behind him on the depth chart. The veteran safety missed time while in Green Bay last season with a groin injury, but Friday's and Saturday's practice sessions should provide more information on his potential availability for Monday's game. Burnett is expected to open the regular season as the backup strong safety behind rookie Terrell Edmunds, Gerry Dulac of the Pittsburgh Post-Gazette reports. Analysis: Burnett signed with the Steelers back in March and found himself in a battle with Edmunds for the starting strong safety spot after the rookie was drafted. Despite being a veteran with a solid track record, Burnett is now expected to open the regular season as Edmunds' backup in the secondary. Burnett, however, still should see a decent number of snaps to open up the season, as the position battle likely isn't completely over. Burnett was back in pads Thursday after missing some time with a hamstring injury, Jeremy Fowler of ESPN reports. Analysis: Burnett missed some practice time after tweaking a hamstring, but barring a setback, the injury shouldn't affect him going forward. The ex-Packer will look to stay healthy the rest of training camp as he tries to learn a new defensive playbook. Head coach Mike Tomlin said Burnett will open OTAs at free safety, Dave Lolley of DKPittsburghSports.com reports. The Steelers and Burnett agreed to a three-year contract Tuesday, Ian Rapoport of NFL Network reports. Analysis: Burnett's eight-year run with the Packers included three 100-tackle campaigns, nine interceptions, eight forced fumbles and 7.5 sacks. Generally, he provided a steady hand at strong safety, but injuries also beset him from time to time, as he suited up for only 102 of a possible 128 regular-season contests. Upon joining the Steelers, he'll line up next to third-year safety Sean Davis within a defense that ranked fifth in terms of yards allowed and seventh in points conceded in 2017. 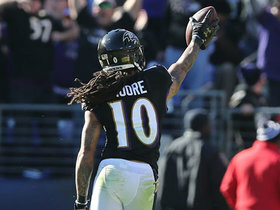 Burnett is flying to Pittsburgh on Tuesday to finalize a contract with the Steelers, James Jones of NFL Network reports. Burnett made 68 tackles (48 solo) and forced a fumble over 12 games during the 2017 season. Analysis: Burnett put up quality numbers for fantasy players in 2016. but he failed to register anything in the sack or interception departments and saw his tackle total take a big drop while battling injuries. A free agent in the offseason, it remains to be seen if Burnett will return to the Packers, or head elsewhere after eight seasons in Green Bay. Burnett recorded a season-high nine solo tackles and a forced fumble Sunday against the Steelers. Analysis: Although Burnett missed the previous two games with a groin injury, he was able to play all 74 defensive snaps without missing a beat. The eighth-year Packer will look to continue his success against the Buccaneers in Week 13. Burnett (groin) is active for Sunday's game against the Steelers. Analysis: Burnett was tagged as questionable heading into Sunday's contest, but given that he was a full participant in practice this week, there was never much doubt surrounding the defensive back's status. Burnett and the Packers' secondary have their hands full Sunday night against the explosive Pittsburgh offense. Burnett (groin) has drawn a questionable designation for Sunday's contest versus the Steelers, Rob Demovsky of ESPN.com reports. Analysis: Burnett was a full participant at practice all week, so it is unclear if he suffered some sort of setback or if the Packers are just being cautious. Rookie Josh Jones would likely fill in at strong safety should Burnett ultimately be unable to go. Burnett (groin) was a full participant in Wednesday's practice. Analysis: Burnett seems on track to return after missing two games with a groin injury. His return would be great news for the Packers with an upcoming matchup against Antonio Brown and the Steelers on tap Sunday night. Burnett (groin) has been ruled out for Sunday's game against the Ravens. Analysis: Burnett will be sidelined for a second straight game due to the groin issue he sustained in the Week 9 loss to the Lions, and the Packers haven't issued a timeline for his return. Josh Jones is expected to hold down a starting role at safety until Burnett is ready to play again. Burnett (groin) will not play in Sunday's game against the Bears and there is no timeline for his return, Wes Hodkiewicz of the Packers' official website reports. Analysis: Burnett returned to action Monday after missing the previous two games due to a hamstring injury, but he will miss at least one more game with his latest setback, and possibly more. With Burnett out, Josh Jones figures to continue playing regularly like he did in Week 9, and more snaps could go to fellow safety Marwin Evans and/or linebacker Jake Ryan, as Burnett has frequently lined up close to the line of scrimmage this season. Burnett is questionable to return to Monday night's game against the Lions with a groin injury. Analysis: Burnett sustained the injury in the third quarter and headed to the locker room shortly thereafter. The veteran safety missed the previous two games with a hamstring injury but was fully healthy following the Packers' bye week. Rookie Josh Jones and HaHa Clinton-Dix will see the bulk of the snaps at safety in his absence. Burnett (hamstring) won't carry an injury designation into Monday's game against the Lions, Tom Silverstein of the Milwaukee Journal Sentinel reports. Analysis: Burnett finished the week with back-to-back full practices after being a limited participant Thursday, and appears recovered after a two-game absence. The 28-year-old is one of the leaders on the Packers defense and should return to an every-down role. Burnett (hamstring) is practicing in full Friday, Rob Demovsky of ESPN reports. Analysis: After logging a full and uninhibited practice, Burnett appears on track to return from a two-game absence Monday against the Lions. His availability will significantly dampen Josh Jones' IDP appeal. Burnett (hamstring) returned to practice in a limited role Thursday, Rob Demovsky of ESPN.com reports. Analysis: Burnett has been sidelined the previous two weeks while nursing a hamstring injury. The 28-year-old's return to practice Thursday, albeit on a limited basis, is certainly cause for optimism regarding his status for Monday night's showdown against the Lions. However, he will still need to be monitored throughout the week. 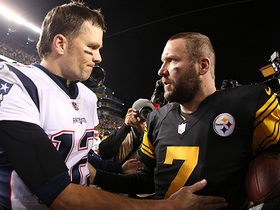 Pittsburgh Steelers safety Morgan Burnett tips New England Patriots quarterback Tom Brady's fourth-down pass to secure a Steelers' win. 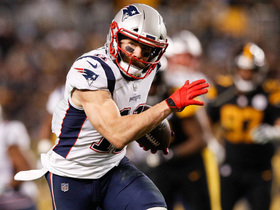 New England Patriots wide receiver Julian Edelman calls for the ball on a 34-yard pass from his quarterback Tom Brady. 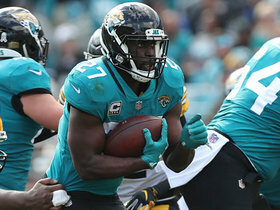 Jacksonville Jaguars running back Leonard Fournette rushes for 20 yards. Baltimore Ravens wide receiver Chris Moore climbs the ladder to pull in 30-yard catch from quarterback Joe Flacco. The Pittsburgh Steelers' defense mobs running back Kareem Hunt for safety. 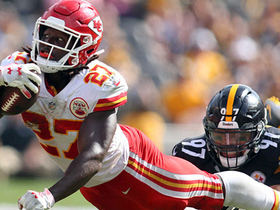 The Pittsburgh Steelers' defense mobs Kareem Hunt for safety. 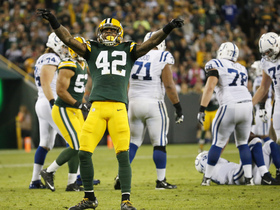 Listen as Green Bay Packers safety Morgan Burnett is mic'd up against the Indianapolis Colts in Week 9 of the 2016 NFL season. 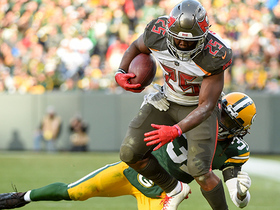 Tampa Bay Buccaneers running back Peyton Barber gains 34 yards on a screen pass from quarterback Jameis Winston. Pittsburgh Steelers running back Le'Veon Bell loses the ball on run up the middle and Green Bay Packers linebacker Blake Martinez recovers the ball. 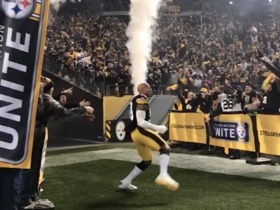 Pittsburgh Steelers linebacker Ryan Shazier gets pumped up as he is announced at Heinz Field before Sunday Night Football.